Finding inspiration for your next bathroom remodel is no longer a struggle. I’m glad the days of “leg work” are gone. Remember when you had to drive in every direction to visit the available stores in your area just for one project? It was even worse when all of them carried the same “boring” styles. If you are like me, you want things done yesterday. And I‘m not the most patient when it comes to shopping for products and accessories. I want to see them all. NOW! But how do you find everything for a bathroom remodel in one place without ever leaving the house? There is nothing better than online shopping for someone who is not interested in driving all over to find each little item for a bathroom remodel. And who has the time to drive around anymore? Lately, my go to online store is Amazon. You can see everything under the sun in one place. Which saves you time and money too. Imagine being able to compare prices with their multiple associated vendors without ever leaving the site. Plus with Amazon Prime, you get 2-day shipping on most purchases. Imagine how much you can save on shipping if you buy a big honking item like a vanity or a heavy mirror (psst, you can try it for free for 30 days!). I know I sound like a big fan but with a busy life like mine, time is money. Even when I’m diy-ing a project or looking to buy items to complete a project I first get my inspiration on Pinterest. Then my next step is to shop online. Take a quick look at my two bathroom remodel projects: my downstairs bathroom and my powder room. I found the inspiration for both of these projects online (see my inspiration images below). And if you love any of the pieces I selected, simply click on the image and you are redirected to the source where you can buy them. The farmhouse toilet paper dispenser is fabulous! My other personal favorite is the wood shelving in the above image. 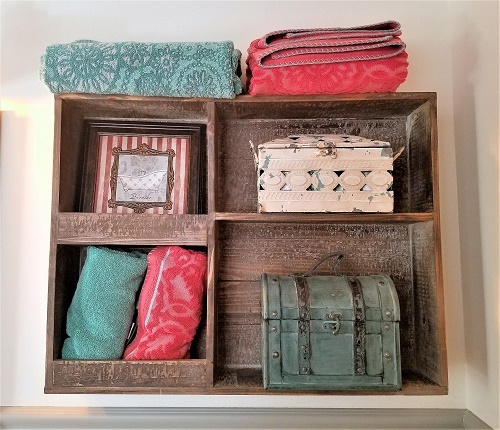 For my downstairs bathroom remodel, I ended up skipping the traditional medicine cabinet and opted for a rustic wood shelf with little storage trunks to hide the “medicine”. The trunks were even big enough to hide an average size can of shaving cream. Who says you need to stick with a traditional medicine cabinet? A little creativity and you can accomplish the same purpose without being boring. The vanity is the anchor of any bathroom project. Unfortunately, due to a major budget setback, I ended up not buying any of my inspiration vanity pieces below. Repurposing my old vanities and creating something similar for both my downstairs bathroom project and my powder room projects was the only other option. But if your budget allows, these vanities “scream” farmhouse style and they will not break your budget (unless the main pipe bursts in your adjoining laundry room-sigh). Aren’t these vanities fabulously farmhouse-y? Notice the “Shaker” style doors of the white vanity above? They look a lot like the doors on my own DIY vanities. I hope you enjoyed my inspirations pieces. Stay tuned for more inspiration posts from my adventures in shopping and DIY-ing around the house. I like your style! We need to collaborate! We sure do! I love your blog too! Rust is my jam! There sure is a cozyness to it that people like. I love it because you can also diy a lot of the design. Cheers! I love all these inspiration photos! Thank You Jessica! Farmhouse style is so in right now and it was so fun to research for the article. Cheers!